There seem to be recurring themes of loss and love in the majority of director Todd Hayne’s filmography, whether they’re in practise within the 70s glam pop era (Velvet Goldmine), various stories inspired by the life and works of Bob Dylan (I’m Not There), or the uncertain McCarthy-dominated era of the 1950s in Far From Heaven. Both themes are timeless, as demonstrated by the multiple time periods that Haynes has worked with over the years, but no matter when the film may be set there is always a way for the director to convey them in the most striking and unique of ways. Carol, his latest film that’s based on Patricia Highsmith’s sophomore novel The Price of Salt, is no different, and creates around its central recurring themes a romantic drama that is beautifully constructed and – most significantly – optimistic to a fault. 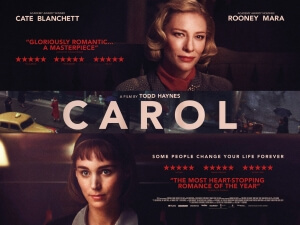 Similar to Far From Heaven, this film takes place in 1950s New York where young department store clerk Therese Belivet (Rooney Mara) is struck by the presence of an older woman named Carol Aird (Cate Blanchett), who is out Christmas shopping for her young daughter. After Therese returns Carol’s forgotten gloves, a friendship strikes up between them which soon becomes even more passionate as their attraction becomes more mutual – however, Carol’s impending divorce from her stubborn husband Harge (Kyle Chandler) complicates things, as is her desire to keep in her life their young daughter in a growingly-bitter custody battle. The mixing of both story elements is where the themes of loss and love come into play, and you can make a guess as to where each of them comes in strongest. What sets Carol apart from the other times that Haynes has worked with these themes is that there is a need for a compromise with the characters; Carol is given the drastic choice of having either the woman she loves or her child whom she loves perhaps even more, which may sound like a no-brainer but all the same a sacrifice needs to be made, and either way it will come as a deep blow to at least one innocent young girl. It’s an unavoidable scenario and one that is purely heart-breaking, especially when you see this woman grow so attached to Therese and how she realises that she may well be her one true love, in addition to watching her being a loving and caring mother at the same time. The compromise between loss and love is vital to the storytelling, something that screenwriter Phyllis Nagy clearly picks up on from Highsmith’s original source material, and it’s miraculous that things turn out as optimistic as it does (with no spoilers, of course) especially when the pain of both themes come as a true sucker punch right in the emotional exterior (or, as the kids say nowadays, “the feels”). Haynes and Nagy command both these themes expertly, working well off one another to create a film that balances both substance and style to a pleasing effect. The “style” element is clearly Hayne’s specialty and it’s in full display here, as this is a beautifully realised vision of Highsmith’s original story that almost makes it seem like a film transported through time to the modern era. The cinematography, sets, costumes et al are absolutely gorgeous and pure 1950s, certainly romanticised but never over-indulgent; and the Christmas setting lends it a magical feeling that’s soothing and wondrous to behold, which Christmas is anyway but there’s something about seeing a 1950s Christmas, especially in a time where Communism and other social issues were dominant in the historical context, that makes it an even more special time of year in that period of history. As for both lead actresses, there’s plenty to write about. Blanchett is, as ever, golden as the older Carol who, as we mentioned, has a lot more dramatic weight to carry with everything going on with her fading marriage, but Mara is perhaps a bigger revelation here; we already know she can be great, thanks to her handful of breakthrough roles in recent David Fincher films, but here it’s unlike anything we’ve seen from her, and that’s what makes her performance here so special and memorable. Essentially the wide-eyed young innocent in the relationship, Therese’s quiet and composed self is reflective of a woman with a cloud of uncertainty looming over her, and it’s only in taking a risk with her new friend and eventual lover Carol that she starts to blossom in ways even she couldn’t have possibly imagined. Her presence is as much alien as it is alluring, and it’s very easy to see why the titular character becomes so drawn to her youthful yet mature composure. Both actresses seem to have a passionate connection with each other, even though it may not be immediately obvious, but even in scenes where they aren’t even talking you can see the sparks flying between them. They are a truly memorable romantic pairing, perhaps one of the most complex and intelligent couples we’ve seen all year. In case it isn’t clear to you yet, we liked Carol a lot. We felt that there was just the right amount of complexity, passion and heart-pounding romance for it to qualify as one of the strongest films of the year, with two excellent lead performances by both Blanchett and Mara carrying it through along with Haynes’ masterful grasp of the 50s-era setting and Nagy’s worthy adaptation of Highsmith’s novel. Put simply, it’s a carol that’s worth singing this time of year. Carol tackles director Todd Haynes’ recurring themes of loss and love to absolutely heart-pounding effect, with Haynes working wonders with Phyllis Nagy’s masterful adaptation of Patricia Highsmith’s novel as well as astounding production values that honour the 1950s setting and, most importantly, two truly brilliant lead performances by Cate Blanchett and Rooney Mara who portray one of the most complex romantic couples of the year.